Wireless Charging Market size was valued at over USD 3 billion in 2016 and will grow at more than 13% CAGR estimation from 2017 to 2024. Growing demand for smartphones is driving the adoption of the market. Chargeable devices such as tablets and smartphones will be easy to carry, thereby modernizing and meeting the demand for safe, standardized, efficient, and portable power recharging options. Factors such as mobility issues and longer charging times of devices pose as a potential challenge for the overall wireless charging market growth. Most consumer devices can only be charged with proximity of receiver or the battery with the charging pad. To overcome these issues, several companies are conducting research to manufacture a device which can transfer power in moving devices and do not require to be in direct contact with the charging devices. 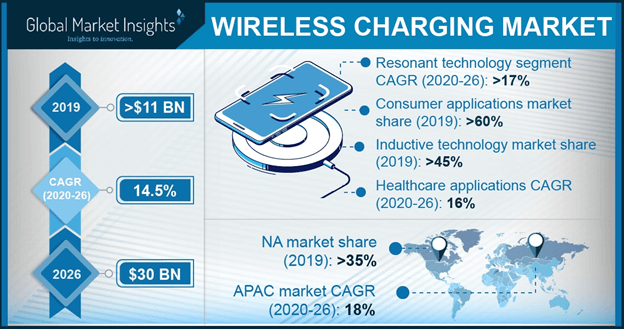 Inductive wireless charging market accounted for majority of the global share in 2016 as it is an advanced and preferred technology for EVs and electronic devices as compared to other technologies. Inductive technology is being used for charging devices such as iPods, laptops, MP3 players, tablets, smartphones, and other devices, which need high power. The Wireless Power Consortium’s inductive Qi standard powers a range of smartphones, accessories and products. It makes use of magnetic induction to propel a device. This necessitates that the device which is to be charged is positioned physically on top of the charger. There are more than 230-member companies and approximately 940 certified products related with Qi. Its power range varies in spectrum of 0W to 2.4kW of power. Although the 2.4kW isn’t available so far, there are working solutions, which are measured as samples and haven’t yet certified to Qi’s own standard. Consumer applications accounted for more than 55% of the overall wireless charging market share in 2016. With the rising application of wireless charging in several commercial spaces, the industry is witnessing an enhanced demand for the technology from consumers. Major smartphone manufacturers such as Apple and Samsung are gearing to incorporate the technology into their flagship products. Widespread adoption of the technology will further drive the development of infrastructure thereby propelling the market. The industry has been gaining traction over the last few years as several businesses are implementing the technology. Manufacturers are placing a high focus on providing a hassle-free charging user-experience. Development in the IT & telecom sector coupled with the increase in number of netizens will be particularly beneficial for the wireless charging market. This trend is further strengthened by the availability of mobile broadband services and escalating population size. U.S. wireless charging market is the largest regional segment, and has witnessed considerable government support. The incentives provided by the U.S government for the development and the usage of the devices include competitive programs to help encourage suppliers and manufacturers investment in R&D and infrastructure. For instance, the Obama Administration announced in November 2016 the establishment of more than 45 national EV corridors which would act as wireless charging networks on highways. Increasing popularity of EVs with high voltages and large battery packs, has stimulated enormous investments in efficient and safe battery chargers. Limited battery space in vehicles, and implementation of non-removable batteries, is driving adoption of the wireless charging market. In-car and wireless charging of EVs are the key trends which are being witnessed in the automotive industry. Moreover, rise in the adoption of EVs in the U.S., UK and Germany will boost the industry growth. Major players operating in the industry include Integrated Device Technology, Inc., WiTricity Corporation, Texas Instruments, Inc., Convenient Power Ltd., Qualcomm Inc., Murata Manufacturing Co. Ltd., Energizer Holdings, Inc, Leggett & Platt Inc., Mojo Mobility, Inc., PowerbyProxi Ltd., Powermat Technologies and Powercast Corporation among others. The wireless charging market is fragmented and consists of large participants and start-ups. The industry is witnessing intense rivalry among major vendors with several players trying to differentiate themselves based on the product affordability and quality. Several businesses are implementing the technology, with users placing a high premium on ensuring a hassle-free charging experience. IKEA was the first company to announce the usage of wireless charging into office and home infrastructure. Limited battery space in products, and implementation of non-removable batteries, is driving adoption. Wireless Power Consortium (WPC), and Air Fuel Alliance are the groups operating in the wireless charging market. In June 2015, two organizations Alliance for Wireless Power (A4WP) and Power Matters Alliance (PMA) formally merged and, were later, rebranded as the Air Fuel Alliance. A4WP communicates with the charging pad integrated with the Bluetooth Low Energy link and the smartphones, which recognizes effective loads, controls power levels, and is used for protecting the non-compliant devices from transmitting the power they are not designed to handle. This is specifically useful when charging numerous devices, as power can be focused to empty devices and not misused on the ones which are full. The merger minimized the number of organizations from three to two and was acclaimed for bringing the goal of an interoperable, single, standard one step closer.